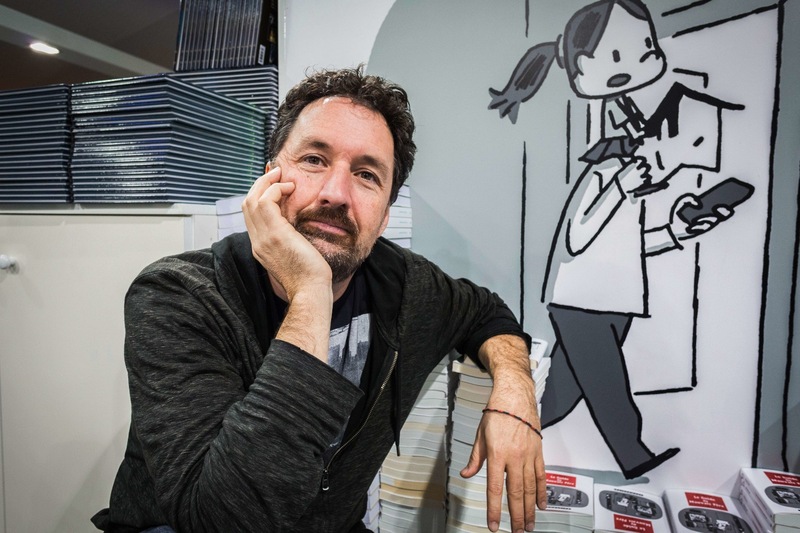 The French-Canadian author Guy Delisle is a modern master of the travelogue. There’s a moment in Guy Delisle’s 2011 graphic novel Jerusalem: Chronicles From The Holy City that nicely encapsulates exactly what it is he does so well. Delisle has taken his car to an auto repair shop in East Jerusalem, the Arab side of town. The driver's-side window has been smashed in. “What do you want, glass or plastic?” the repairman asks. Delisle is confused. He’s never heard of plastic windows. The repairman nonchalantly explains that Jewish settlers prefer plastic because “it holds up better when they get stones thrown at them” by Palestinians protesting the settlers’ encroachment into the West Bank. So we have hardline Zionists coming to Arab shops — and being tended to by Arab proprietors — to find fixes for windows smashed in by the very Arabs they’re committed to expelling from Israel. “We’re open Saturdays,” the repairman explains, nonchalantly, “and it’s cheaper here than in the settlements.” It’s a finished, odd little loop, and it gets at some truth of the Arab-Israeli conflict: that nestled within the tragedy, there is a constant stream of surreal moments. Delisle, who is originally from Quebec City, debuted with 2000’s Shenzhen: A Travelogue From China, then followed that up with what is possibly still his best-known work: 2003’s Pyongyang: A Journey In North Korea. Delisle wasn’t there as a journalist, nor did he sneak across the demilitarized zone. He was duly invited into the mercurial land to oversee North Korean animators (a famous source of cheap labor for the industry) hired to draw a French children’s cartoon. It’s an approach that serves him well in his latest release, Hostage, an exhaustive account of the 1997 kidnapping of a young Doctors Without Borders employee by Chechen separatists. 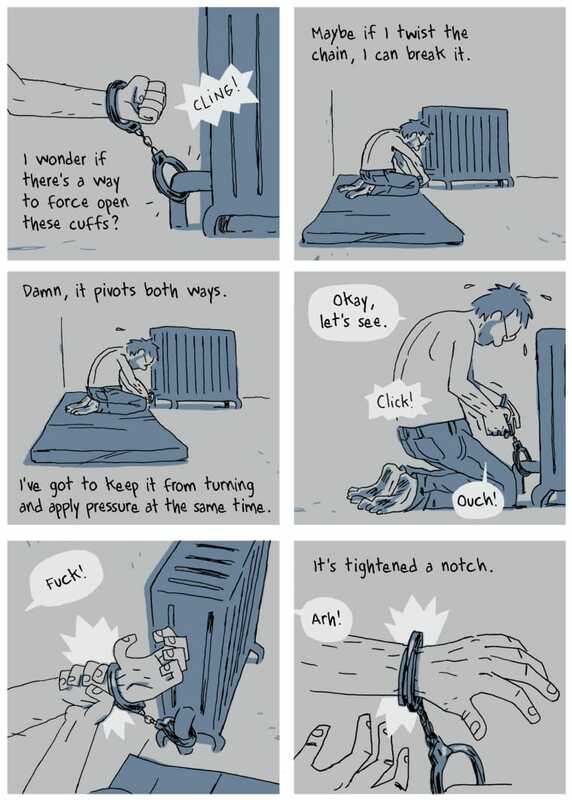 As the writer Sarah Glidden puts it in her back-cover blurb: “A book about a man chained to a radiator should not be exhilarating, but … my heart was racing by the end.” It’s true: pages and pages of nearly-identical-looking panels somehow ends with a surge of blood-pumping adrenaline. 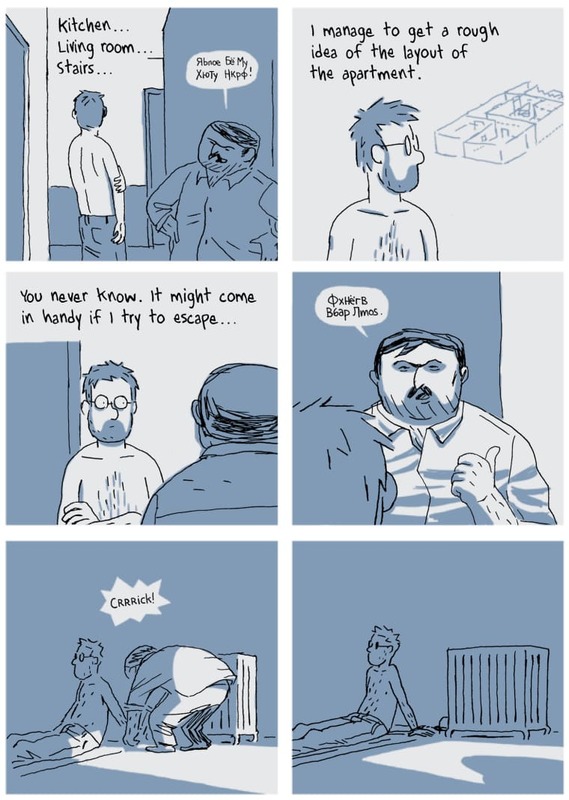 A page from Guy Delisle's 2017 book Hostage. No matter what country you’re writing about, you seem to hit a lot of diplomatic and NGO parties. What’s the best NGO to party with? [Laughs] My wife worked ten years for Doctors Without Borders. They’re young and cool people. Always fun to be with them, all around the world. It was a very good time. You write also about how the doctors in Doctors Without Borders are almost all smokers. I was wondering, do you think there is some cynicism that has to come with doing humanitarian work? It was your wife’s Doctors Without Borders assignments that brought you to Burma and Jerusalem. Is it strange, being assigned your next home? It’s exciting, actually. Hearing that we were going to Israel, we said, “yeah sure, it would be nice for once to have the Internet!” Compared to Burma, where you couldn’t have Internet. I didn’t know we would be in the most remote area of Jerusalem. But it was interesting: the book would have been totally different if I was in Tel Aviv, or even a different part of Jerusalem. You can [be sent] to Japan, or Jerusalem: me, I don’t care. It’s fun. I go with the family. These places, they can all be interesting. 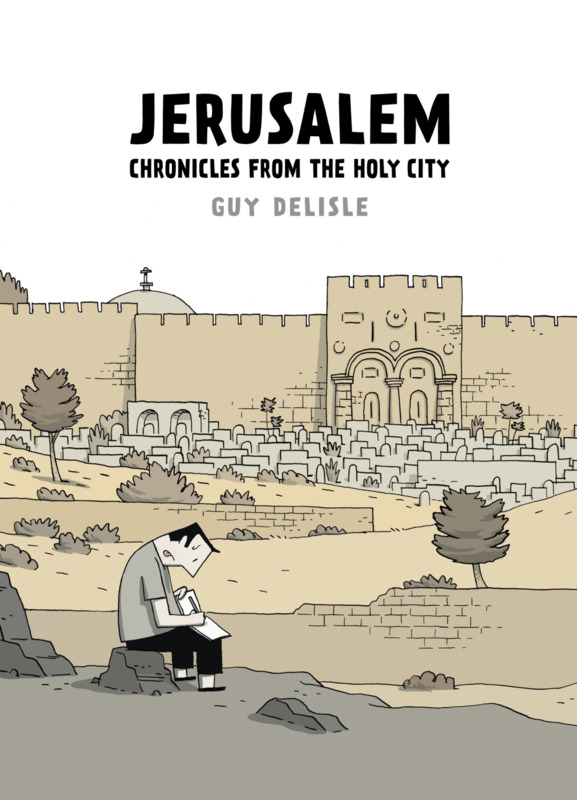 The cover of Guy Delisle's 2011 book Jerusalem. Israelis are famously protective of their self-image. How did they receive the book? Yeah, yeah, some of them don’t like the book at all. I receive a few mail here and there. But I receive a lot of positive ones, too. It’s such a crazy country, such a crazy city. And I don’t really care about the Jewish people that don’t live in Jerusalem. They have a very different way of seeing Jerusalem; it’s more like a fantasy. The people that live there, they know what I’m talking about. You also got to travel extensively in the West Bank, where Israelis don’t go. They’re not allowed to go there. There are big red signs saying “Israelis are not allowed, it’s too dangerous.” So it’s a bit crazy. A tourist can go, but Israelis don’t see this whole other side of their country. It’s very hard to imagine the same situation in our countries. Can you imagine in the States, there’s a place you couldn’t go? North Korea is in the news a lot these days. Do you recognize what you see on TV as what you saw in person? When I was there, I was not invited to see these [military] parades. But you keep seeing them: there’s always another anniversary of something to celebrate. But when I was over there [in 2001], Bush was recently elected, and there was tension as well, and they like it. Dictatorships, they love it when there’s tension. It’s easier to come down on the population when there’s tension. 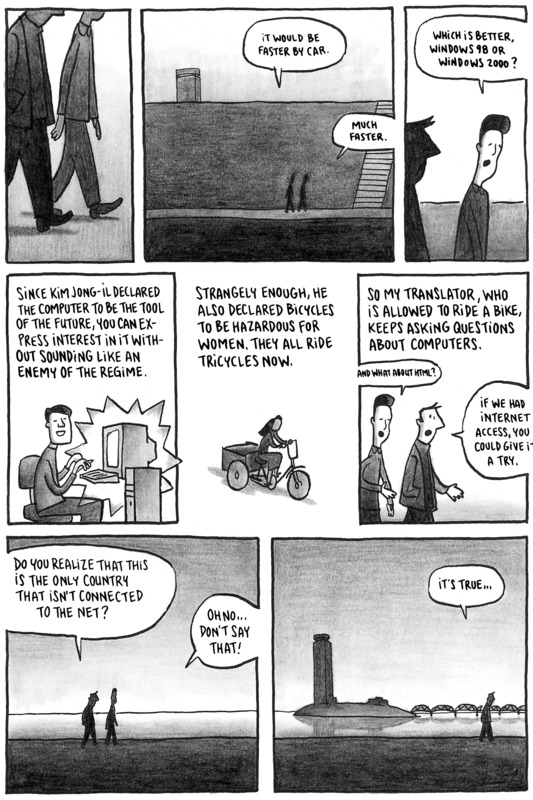 A page from Guy Delisle's 2003 book Pyongyang. In Pyongyang you wrote of the inevitability of the regime’s collapse. Does it still feel like that? Yeah, well — I would have thought that it would have collapsed faster. There was a time where we saw a few guys falling down, like Qaddafi, the guy from Libya. But North Korea, now they have the nukes. So I think they’re [gonna be] there for a long time: with the nuclear power, it’s hard to take these dictatorships down. But some day its gonna collapse. It’s not sustainable. The World Food Programme is still feeding one third of the country. So I don’t know: maybe if they had to feed their own people all the time, they would have more problems? It’s a crazy situation. It shouldn’t be there. But, still. How did you first start working on Hostage? I met Christoph [André, the titular hostage] through a friend who worked at Doctors Without Borders. One day she invited me for dinner and she said he’s gonna be there. I knew Christoph's story, but just from the newspaper. I ended up next to him at the restaurant and I started asking questions and I was surprised because he was quite at ease. I was thinking it would be a traumatic experience, and he’s not gonna wanna talk. He gave us all the details! I remember me and my friend listening to him, going “wow, this is great.” Right away I could see it as a comic book. Then other work got in the way? Yeah, I kept postponing it. Right after I met Cristoph I was asked to go to North Korea. And then I kept traveling and kept doing books and fifteen years later, I was thinking, “well now is the time, or never.” I did the first version right after me and Cristoph met, but then I threw that in the garbage. It was more an action story. But the more you put effects, the farther away you’re gonna be from real life. By the end of Hostage I was totally surprised. Do you think it would have worked as a book if [SPOILER ALERT] Christoph hadn’t escaped? If he’d just been freed through negotiations? 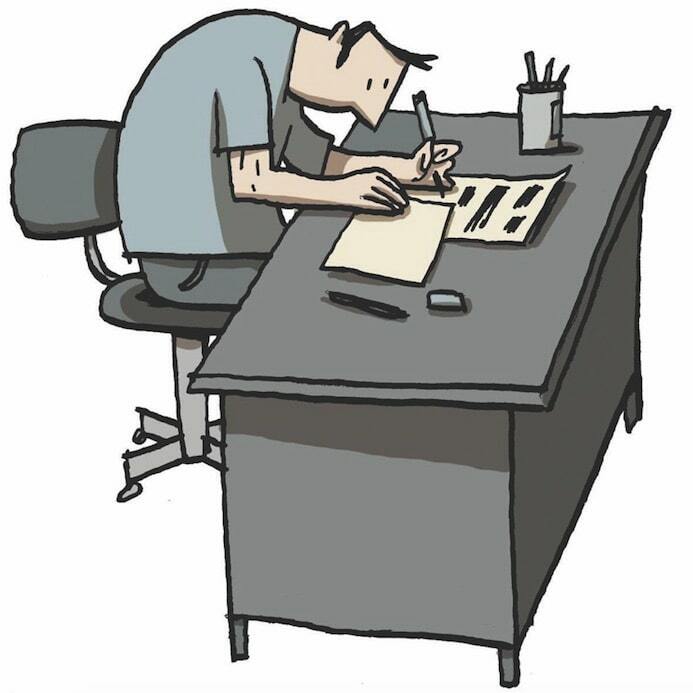 A self-portrait by the graphic novelist Guy Delisle.